Pictured: An asterisk which has completely 100% definitely been there since 1789. “NO” had been underlined three times. Preliminary forensic tests point toward the asterisk being the product of late night vandalism, but Washington remains divided on whether or not it was a part of the original text, with the majority of conservatives claiming the document has always contained the markings. The controversial incident comes on the heels of such divisive topics as the University of Missouri protests to the Syrian refugee crisis, events that have called into question who the government does – or does not – protect. Texas Senator and presidential hopeful Ted Cruz was suspiciously quick to defend the belief that the asterisk had always been part of the document. 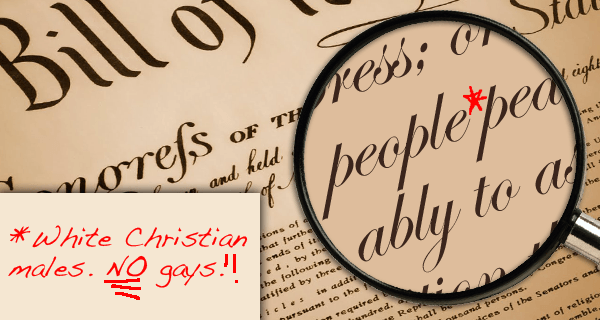 “People say it looks like my handwriting, but ever consider that’s because me and the founding fathers are the same people with the same good, Christian values?” he said. “Trust me, I wish I could take credit for those absolutely genius words, but I definitely can’t because it’s been there the whole time.” He then added, “I wouldn’t even know where to buy a red pen!” which are believed to be the first true and accurate words spoken by the candidate during his entire campaign. President Obama announced that the White House is taking all precautions to identify the vandal, which was immediately seized upon as another example of the President’s wasteful, divisive, partisan politics. Barbecue sauce fingerprints were also discovered on the parchment, but investigators are still determining whether or not they are connected to the asterisk.